To complement our extensive landscape construction services, we also offer a more specialist service to both design and install a wide selection of independent garden features. We are happy to offer this service as part of our garden landscaping works, or as specific projects. 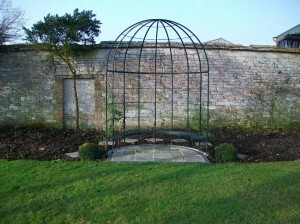 Such items include the construction of both masonry and timber structured outbuildings, bespoke timber pergolas and arches, as well as distinctive formal and natural water features. 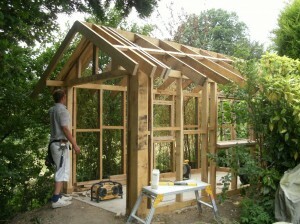 A commissioned green oak building under construction – a very specialist service offered by our skilled staff. 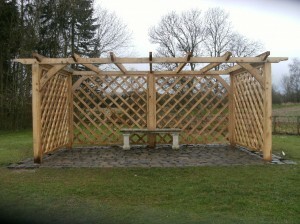 The majority of such structures are custom items built on site to produce unique original garden features. These can be based upon any ideas you may have, or can be explored as part of our site consultation and potential design service. 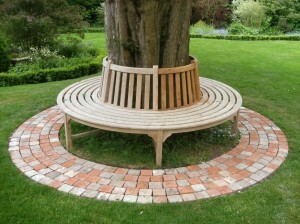 A custom made hardwood tree seat with brick halves paving, and a half arbour with reclaimed natural stone paving beneath. If you are looking for a spcific garden feature, cannot find it in kit form, or want to avoid the ‘mass production’ look – we will do our best to build it! With a great team of staff with various different specialist skills, we can make the majority of your garden dreams come true. 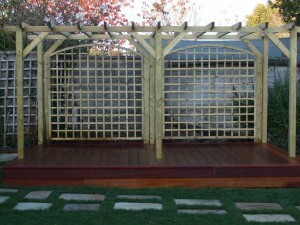 Two of our custom made pergolas with trellis sections, one in hardwood and one in softwood. 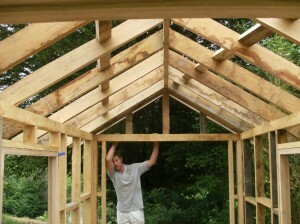 We are more than happy to prepare quotations for any of the custom garden structure services listed above, or any similar services. If you would like to arrange a free site visit and consultation, or want to discuss your requirements further, please do not hesitate to Contact Us.